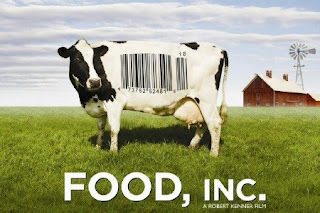 My wife and I watched a very interesting and, by seeing how my Sunday went, potentially life-changing film called “Food, Inc.” It’s basically a documentary that tries to cover the steps of where our food comes from. It’s not as graphic or gory as some documentaries I have watched on the subject of animal cruelty and factory farming. Sure it has a little of that and there are some tear-filled moments, but this film is less sensational and more informational. After a long discussion with Stephanie about what changes we could make in our family’s diet we decided to do a bit of research. Fortunately, our diet is filled with a lot of home cooking with fresh meats, fruits and vegetables. Plus we buy a lot of organic products. Very little of our consumption is processed foods and we had already eliminated high-fructose corn syrup from our diets a few years ago after Stephanie watched an episode of Oprah featuring Doctor Oz. What you learn in Food, Inc. is that “organic”, “natural”, “anti-biotic free” are labels that while good are simply scratching the surface and factory farming has bastardized many of the terms. So what do you look for? Here is an article I highly recommend everyone to read: Avoiding Factory Farm Foods. Read it and then come back to this article if you care to see what changes we did. A few easy decisions involved changing our diary choices. We bought a lot of Organic but only milk from the Organic Valley brand. They are very well respected and a very easy decision when buying diary products so we are now exclusively using their products. Sure there are some other labels out there that are just as good, but Organic Valley is pretty much everywhere we shop. We eat a lot of meat, mainly boneless, skinless chicken which is probably 70-80% of our meat choice. Stephanie doesn’t eat seafood and I eat very little of it. The other 20-30% is mainly beef and a little pork. Our beef and pork are all bought from Costco. Well, I should say WERE bought from Costco. We’ve decided to go exclusively with a farm that we bought some meat from at last summer’s Birmingham Farmer’s Market – John Henry’s. It’s a local farm that raises pasture beef and pork. They do home delivery in our area. I used to bulk buy from Costco and individually freeze the meat with our Food Saver. Now I’ll just buy bulk from John Henry’s Farm and freeze. Chicken can also be purchased from John Henry’s but I wanted to see if we could find it more easily since it’s a larger, more frequent part of our diet. Please share any brands, products, farms, etc. that you do to improve how and what you eat. What is your favorite olive oil for salads?